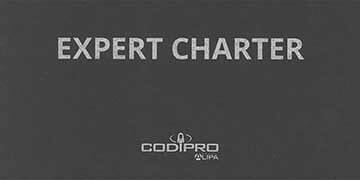 In early 2014, CODIPRO presented its “EXPERT Charter” to its partners for the first time, with the primary goal of increasing transparency in trade relations. Three years later, the partners became “EXPERTS”, and they now also convey the values that CODIPRO holds dear: honesty, professionalism and transparency. CODIPRO continues to evolve, and a new version of the Charter will come out in 2019. The launch of the new GRADUP range in 2018 surpassed the most optimistic forecasts, and innovation is already at work on the digital revolution. “In this next version of the CHARTER, we wish to strengthen the ties that bind CODIPRO to its EXPERTS. Simpler classification and refined privileges are among the new concepts that will allow us to remain competitive in industry 4.0,” states Christophe Losange, Director of CODIPRO. Be patient and stay tuned because the 2019 version of the EXPERT Charter will be here very shortly!